How does auto-messaging really work? When you configure an automated message, the message waits on the system till it meets the trigger condition (for instance, workout completion). As soon as the trigger condition is met, the system then checks for configured parameters, like wait time and delivery time, before delivering the message to the client group. You can read more about configuring an automated messaging campaign, here. What can you do with auto-messaging? Automate onboarding: Create a sequence of messages that will be automatically sent to your clients when they signup for a training plan. This includes a personalised welcome message, followed by highly relevant workout tips on the assigned training plan/schedule. Perfect for online bootcamps or fitness challenges. Improve client engagement: Nurture your clients throughout their fitness journey and showcase the full-value of your personal training. Automatically share workout feedback, send follow-up messages when they miss workout sessions, and boost their morale when they stay consistent. Streamline processes: Say goodbye to excel-sheets and follow-up emails. You can now use auto-messaging to streamline all your business processes, right from logging assessments, documenting client information to collecting payments. Boost conversions: No more awkward follow-ups or sales calls. You can now prompt your clients to do a plan upgrade, when they have the highest probability of conversion (for instance, after logging their 21st workout, if they're on a 3-week FREE fitness trial plan). Save time (and money): Forget switching between multiple apps, like, email, WhatsApp, messages and more. 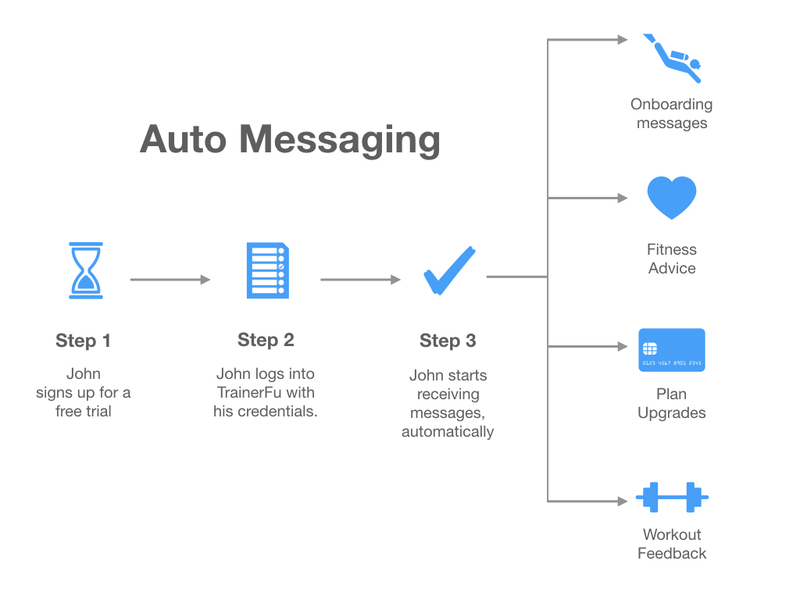 All the auto-messaging sequences that you configure for your clients show up on the TrainerFu chat window, thereby enabling you to keep all communication at one place.